Yosemite had always been on my list of “10,000 Places to See Before I Die”, but I always thought that I would save visiting it for last. One would think that as a member of the Yosemite Park Conservancy, who receives newsletters and invitations to Yosemite events, I should already have visited Yosemite on many occasions. Perhaps it was that kind of familiarity and the proximity to home (3 ½ - 4 hours’ drive away) that kept me from visiting sooner. This past week, however, I found myself marveling at the grandeur of Yosemite. A visiting relative from Alaska wanted to experience driving in California, so I left the driving to him. We drove through the undulating hills of California’s central valley, the ugly landscape, due to the harsh effect of drought, and the beautiful landscape *(pictured below). The drive to Yosemite was definitely a challenge, especially the drive through the narrow Highway 120 Priest Grade. The steep and narrow road tapered ahead of us as we climbed more than 6000 feet. We drove through the forested area where the road seemed to have split the area into a well-arranged group of trees. We passed the Gold Rush towns of Big Oak Flat and Groveland before reaching the Yosemite National Park entrance. After driving another 40 minutes or so from the park entrance, we saw the “Grand Welcome” sign in the form of the iconic view of Yosemite Valley with the Half Dome sandwiched between El Capitan, the Sentinel Dome and the cliffs of Glacier point. In my excitement at seeing the spectacular view, I immediately got out of the car and accidentally dropped my fanny pack. After passing through three tunnels, we made our way to the valley floor where the road turns into a one-way road. Glad I was not driving because the views were distracting; the massive rocks and giant trees rose above us making all the cars look super tiny. We spent a couple of hours on the valley floor (Yosemite Village) for lunch and for the much-needed break after the long drive. I realized then that my driver license was missing and it was on the fanny pack that I dropped at the scenic lookout. So I had to go to the visitor center to check if someone found it and turned it in. It was not there, so we went back to the scenic lookout. After checking into Curry Village, our glamping site, we drove for another hour through steep and narrow road to watch the sunset at Glacier Point. We passed a parking lot (Tunnel View) with a few cars and people apparently waiting for the sunset. We stopped and thought about watching the sunset there instead. However, our designated driver was set on watching the sunset at Glacier Point. The orange sunset peered through the trees as we drove through the steep and winding road with no guardrails. We arrived at Glacier Point near dusk to a spectacular view. The drive was well worth it. The drive back to the village was scary though, as it was dark and the visibility on the winding road was very low. J, the video game expert, noticed a planetarium that came to life. We stopped at the Tunnel View so everybody could enjoy the open sky full of a million stars. The following day, we attempted to wake up early to go hiking first thing in the morning, but the heavy breakfast became the boys first priority. After breakfast, we took the shuttle bus to Happy Isles, where we set off to hike the Mist Trail and John Muir trail to Vernal Fall and Nevada Fall. The hike listed as moderate to strenuous turned out to be the most popular. We hiked with people from different age group and people speaking different languages. The trail goes uphill with spectacular views along the way: views of Half Dome and the surrounding peaks, the river below, towering trees and impressive boulders. But it seemed that all hikers were going after the spectacular views of the waterfalls. Passing a footbridge, we saw a glimpse of the falls. After the footbridge, we proceeded to the Mist Trail that lead to a steep granite stairway of over 600 steps. I had traveled the world, but never experienced such jaw-dropping views as from the top of the Vernal Fall. We continued on to John Muir trail to Nevada Fall for more spectacular views. Yosemite National Park simply provides the most phenomenal backdrop for hiking that leaves you feeling refreshed. I simply had to breathe the mountain air to replenish all that sweat and energy I lost from hiking. It was inspirational and mesmerizing! Later, we took short hikes to Mirror Lake and Yosemite Falls so we could take photos of the waterless lake and waterfalls. From a photography perspective, Yosemite National Park has no bad angle. Anyone can point and shoot and produce a great photo. For example, I took the photo of Half Dome rising above the trees from the Curry Village parking lot. However, as a photo enthusiast, I really enjoyed the trip to Glacier Point where I was able to take dramatic landscape photos of the mountains changing colors with the setting sun. At Glacier point, I caught a little bit of the dusk light hitting the mountains and creating different shadows and colors. When the water caught the light, it created a reflection of glittering and dancing silvery rounds on the bridge arch. 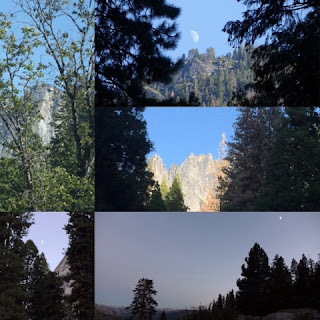 There were so many spectacular sceneries that I was not able to capture in photos, like the sky full of stars, the grandeur of El Capitan, the rainbow created by the waterfall spray. The photos can't do justice to the natural wonder that is Yosemite. The beauty of Yosemite speaks to the soul. So it’s definitely not my last visit to the park. I cannot wait to come back and experience hiking the meadows and mountains, and to see the Mariposa Grove giant Sequoias (scheduled to reopen in the spring 2017), and perhaps take photos of the Mirror Lake with water and Yosemite Falls with the roaring waterfalls.